Integrity assessment of gas distribution pipelines is a priority for all gas utilities operating cast iron pipelines. The approved methods for integrity inspections give gas utilities baseline information, but because large and small diameter cast iron distribution pipelines are unpiggable, have poor mapping and a maze of internal obstacles the integration of new technology is necessary. This necessary integration will provide gas utilities with new data that can improve the safety and reliability of their cast iron infrastructure. Utility integrity management programs need to define how to safely manage their inventory of the cast iron — both small and large diameter. The small diameter cast iron pipelines currently in operation are prone to cracking and graphitic corrosion, causing methane to leak into the environment. While replacement efforts remain a high priority, the pipelines can be visually inspected to help operators effectively manage the pipe for leak investigation, damage, debris, unknown features and address poor mapping issues. Large diameter cast iron, however, remains one of the most reliable pipeline materials with thick, strong walls that are capable of delivering safe and dependable service for many more years. Rehabilitation of these large diameter mains are more cost effective than direct burial replacement and work to eliminate the risk of joint leakage. Through visual assessment and rehabilitation, gas distribution utilities have the tools at hand to reduce risk, manage integrity and improve safety. 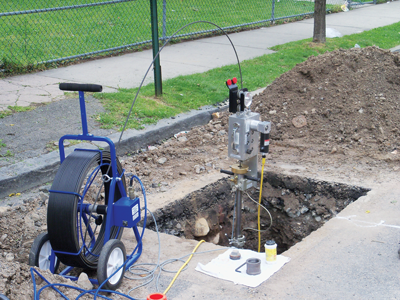 The robotic operator takes sensor readings of the cast iron pipe wall with the CIRRIS XI. Sensor data is then provided to SGN for assessment and integration into their integrity management program. For decades, video inspection has provided pipeline operators with a way to assess the integrity of their systems. These pipeline inspection tools, which were originally developed to aid in sewer maintenance, traditionally required the main to be shut down to gather the visual inspection data. Utilities are still using these systems to assess their pipelines, but there is a growing need to advance the technology to assure the integrity of cast iron pipes. 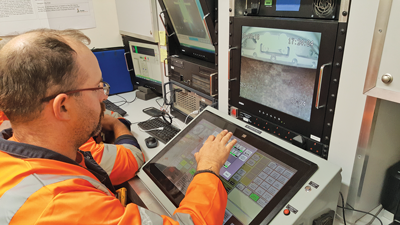 New technologies provide operators with the ability to identify the integrity of their pipelines from the inside and under live gas condition. The systems identify features including connections, new mapping, and also providing high-resolution visual inspection and data-rich sensor inspection. With this type of necessary information and data, utilities can identify pipeline damage and prevent pipeline failure. When not properly addressed these issues can cause harm to gas customers and the environment. As a result, utilities are working to understand how to use new technology and implement new methods for better, more accurate methods to put the assessment data to use. To enhance integrity assessment, research and development engineers in the gas industry have developed technologies and are refining current systems — advanced CCTV inspection and non-destructive testing (NDT) — to provide pipeline assessment and inspection solutions that allow for safer, more predictable future in cast iron pipelines. 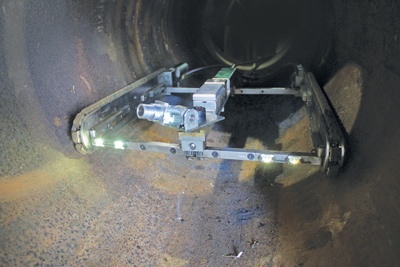 No-Blow CCTV Crawler Inspection System inside pipeline. CCTV has been used in the gas industry for many years, but the development of two live gas main CCTV camera inspections systems progressed internal pipeline visual assessment forward. The specially designed pipe inspection camera and crawler, and their entry systems were both championed by utility collaboration and research and development investments to enable gas utilities to take advantage of visual inspection of cast iron and steel pipelines while the gas is still on. The gas line inspections are conducted in real-time, allowing utility personnel to get immediate access to the visual inspection data that informs maintenance and repair activities — such data includes signs of damage and corrosion, as well as poor pressure issues caused by water infiltration and blockage. No-Blow CCTV Crawler Inspection System on surface. These CCTV camera systems have since been distributed to and deployed by numerous gas distribution utilities throughout the U.S. and overseas markets and have achieved a positive impact on utility field operations. By using visual inspection to inform and drive critical decision-making utilities have realized improved safety and operational efficiencies, as well as cost savings and reduced disruption to customers. In the last decade, the NDT industry has experienced gradual changes not only in the technologies that have been adopted but also in new products that have been introduced. While some believe that disruptive innovation is unlikely with NDT in the gas utility industry, evolving technologies such as robotics and data analytics, offer a new approach to assessing the integrity of large diameter cast iron. More gas utilities around the globe are looking for innovative methods to not only assess the pipeline integrity but also to prioritize rehabilitation and replacement projects — ensuring replacement programs target high-risk assets first. Following this, utilities work to rehabilitate the lower risk, large diameter cast iron, meaning that the valuable infrastructure can remain in the ground — reducing costs and the social disruption caused by traditional pipe replacement. Using innovative NDT systems allows utilities to investigate their pipelines’ features, identify anomalies and deliver data that provides the new, informed data required to help determine the pipeline’s integrity and its future operation. Throughout Europe, there are approximately 55,000 miles of aging large diameter cast iron gas pipelines in current use. UK Gas Utility SGN serves 5.8 million customers throughout Scotland and the south of England, and despite an on-going transformation to plastic pipe, over 16,000 miles of large diameter cast iron gas mains remain in place within the utility’s distribution area. In 2012, after adopting robotics to internally repair their cast iron infrastructure, the gas utility wanted to expand their use of robotics to assess their pipeline internally. To do this, a solution to determine remaining wall thickness and stress was needed. In 2014, SGN established a collaborative project to develop the technology capable of assessing and repairing large diameter cast iron gas mains to avoid costly and disruptive replacement of the assets. Partnering with US-based energy research and development company ULC Robotics, the CIRRIS XI Inspection System and the CIRRIS XR Repair System were built. After the intensive three-year research and development project, the CIRRIS XI Inspection Robot was launched commercially for SGN in November 2016. 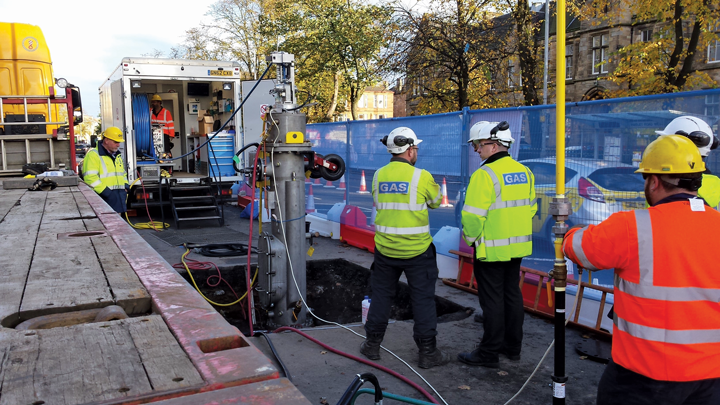 Working in Glasgow Scotland, the robotic system is internally assessing the condition of cast iron pipelines and collecting critical pipeline integrity data using two specialized sensors. The first sensor technology which was specialized for this application is Electro Magnetic Acoustic Transducers (EMAT) and is used for measuring pipe wall thickness and graphitic corrosion. The second specialized sensor technology deployed for the CIRRIS XI Inspection Robot is Barkhausen Noise sensors which are used to measure stress in the pipe wall. The measurement data from these sensors provide quantitative pipeline integrity data and allows SGN operators to manage large diameter cast iron mains using actual pipeline data. Before now, network operators were unable to obtain this type of integrity data from inside live gas mains and made replacement decisions based on leakage and repair history as well as age with sporadic coupon sampling. Assessing the integrity of live cast iron mains from within has never been done before and is a new concept to gas distribution utilities. As such, off the shelf technologies were not readily available and had to be custom developed to meet the demands of the application, including commercial viability. Yet, the robot is now working as a commercial operation inside SGN’s large diameter cast iron network. Sensor readings are being taken and collecting data on the pipelines’ wall thickness and stress which will then be put into mains risk calculations to improve decision making about the future of the pipeline’s operations. The CIRRIS XI Inspection Robot is working to avoid costs and disruptions associated with other methods of pipeline integrity management programs. SGN is using the data delivered by the robot to extend the use of their diameter cast iron assets by following integrity inspection with pipeline rehabilitation using CISBOT — the cast iron joint sealing robot, and in the near future the CIRRIS XI robot’s counterpart, the CIRRIS XR to stop and prevent pipeline leaks from forming at the joints of their cast iron pipelines. The development and implementation of robotic inspection and repair technology is allowing SGN to work towards ensuring their cast iron mains can remain a part of their safe and reliable distribution network. Also, by keeping their pipelines in operation, they can reduce the costs associated with cast iron pipeline replacement, reduce environmental impact and outage time for customers. For other utilities, the work means learning from SGN’s comprehensive inspection data and advanced repair methods and integrating this new technology into their integrity management programs. Adopting CCTV and NDT technologies to inspect cast iron pipelines gives gas utilities long-term integrity data to deliver proactive data that will determine the useful life of their distribution networks that can be incorporated into robust integrity management programs. While no single tool can identify every threat to large diameter cast iron pipelines, using new technology to enhance the confidence of proven and approved methods is a step forward. As more research is conducted to find new technology and refinements are made to those currently in use, gas utilities that continue to operate large diameter cast iron and implement the technologies available into their integrity assessment methods can continue to deliver gas knowing the network is stable, safe and more reliable as the result of innovation. Ryan McGowen is director of field operations at ULC Robotics, a leader in product development and engineering services for the natural gas, energy, industrial and electric distribution markets. The company is responsible for the research, development and commercialization of the PRX250 Pipeline Inspection System, the Small and Large VGC Live Gas Main Crawler Inspection Systems, as well as the CIRRIS XI Inspection System and the CIRRIS XR Repair System.